Social workers speak out about the profession's role in combatting a clear and present danger. While climate change is denied, debated, and routinely discussed as a phenomenon the effects of which will be seen in the future, people the world over—particularly those with the fewest resources—are already feeling those effects and reeling from their impact. As climate change foments natural disasters such as hurricanes Harvey, Irma, and Maria, Americans are increasingly recognizing that the threat to public health is neither imminent nor emergent, but is, rather, an existential crisis. As a profession dedicated to supporting the most vulnerable among us—those disproportionately affected by environmental disaster—social workers can play a key role in the fight for environmental justice, helping to prevent and address the consequences of climate change through education, advocacy, community organizing, and research. "Climate change is understood to be a public health issue because it affects the quality of our water, air, food supplies, and living spaces in a multitude of key ways," according to Terri Klemm, MSW, LCSW, an associate professor of social work and director of the Bachelor of Social Work program at Centenary University in New Jersey. "Since the year 2000, we've experienced 16 of the hottest 17 years ever recorded. In fact, in every year for the last several years, we've exceeded the previous record for the hottest year in recorded history. It's past the point where we can talk about climate change only as an issue that will impact future generations because we're beginning to feel some of the severe effects of the climate crisis now." "Extreme events like heat waves, heavy rainfall, and winter extremes are more likely with a changing climate," says Lisa Reyes Mason, PhD, MSW, an assistant professor at the University of Tennessee College of Social Work. "The increasing number of these extreme weather events—hurricanes that are unprecedented in size and strength, for example—are very much in line with what climate scientists have been warning we should expect as a result of global warming," Klemm says. These extremes, Mason says, also lead to increased flooding, prolonged draught, and greater risk of wildfires, which in turn result in "greater incidence of infectious disease, illness, death, and emotional or mental stress. During heat waves, for example, people with preexisting health conditions such as asthma may be even more likely to suffer health problems." With drought, explains Cathryne Schmitz, PhD, MSW, a professor in the department of social work at the University of North Carolina at Greensboro, the quality of the water supply decreases, and with disasters such as hurricanes Harvey and Irma, illnesses are spread through the water. "All of this," Klemm says, "adversely affects not only our physical health, but just about every aspect of our well-being." "The mental stress and trauma of flood events like those caused by Hurricane Harvey can have chronic, long-term impacts without adequate treatment and care," Mason says. The New York Times, for example, recently reported about the long-term effect of Hurricane Katrina on the children it displaced, noting that mental health issues spiked drastically after the disaster, and the stress of displacement depleted many of the youngsters' ability to cope, particularly those with few or tenuous social supports and resources. Schmitz says natural disasters such as hurricanes Harvey and Irma, as with other consequences of climate change, strike the most vulnerable areas and the most vulnerable people within those areas. "Historically, people with the most vulnerability have contributed least to the problem of climate change—in other words, have contributed the fewest greenhouse gas emissions through consumption and everyday living—but are the most vulnerable to its negative impacts," Mason says. "These include children, older adults, women, people with low incomes, indigenous communities, people from racial or ethnic minority groups, and those from developing countries." "Women in poverty and of course women of color are most impacted," agrees Schmitz, who adds that refugee women and single-parent families also are disproportionately affected. "The poor and immigrants and refugees, whether documented or undocumented, are often harder hit and have fewer resources with which to recover. If you have resources and you are severely affected, you can come back. If you don't, it's even harder, and some people don't come back." During Hurricane Irma, for example, not everyone had the ability to evacuate, placing some at greater risk. People are told to evacuate, but, Schmitz says, "[Florida is] a long, skinny state with only two highways. People had problems finding gas, the highways were blocked, and people without resources couldn't afford to fly and many didn't have cars. If they're undocumented, they may have been afraid to contact authorities to get help even though in these areas the government made it clear that they wouldn't deport them." Further, she says, more vulnerable populations may live in neighborhoods that may be ignored, even by first responders. "We know all too well," Klemm adds, "that toxic waste sites and other environmental hazards are disproportionately located in low-income communities and communities of color when compared with wealthier and whiter neighborhoods. Ultimately, climate change endangers us all, but marginalized communities—people who are vulnerable, oppressed, and living in poverty—are disproportionately impacted already." In addition, she says, "young children, elders, or those who have chronic health conditions are also at greater risk. And as the consequences of climate change continue to spiral, more and more people will be directly affected, so climate change not only disproportionately impacts vulnerable communities but also will increase the number of those who are vulnerable. Tragically, we can expect to see growing numbers of climate refugees, people who are displaced from their homes because of sea level rise, drought, and a host of other environmental and sociopolitical consequences of climate change." Environmental justice, agree social workers, is everyone's business. "Technical solutions to climate change are essential, such as renewable energy, infrastructure improvements, and drought-resilient crops. But social solutions are equally as important, yet often overlooked to date," Mason says. "Social workers, engineers, geographers, public health practitioners, and other professionals must work together to ensure that technology advancements are accessible to and benefit the most vulnerable groups, and what technology cannot solve must be addressed through innovative social change strategies using participatory, community-engaged approaches to solving problems together." Schmitz agrees, adding, "We need to be working with people who are studying the biology and the geography and looking at climate issues from a hard science perspective." It isn't enough, however, she says, "to have good science if you don't have people involved in helping people with climate change. We need social workers to educate and bring people together, to change communities." And to do that, Klemm says, "there are countless opportunities for collaboration, not least with grassroots activists, community leaders, and policy makers at every level." "While there's been some ongoing discussion of the need for social work to be more directly engaged with environmental issues for several decades, the profession has been slow to embrace this as part of our role," according to Klemm. "Many of us are just beginning to consider the practical ways in which social workers can contribute to these efforts. But it's clear that the social work profession is fundamentally well suited to environmental justice work. Social workers are change agents. We begin with a person-in-environment framework, an understanding of the importance of relationships and coalition building, a systems perspective, and the skills to engage, assess, and intervene at multiple levels." "Our values as social workers ground us in serving the most vulnerable groups," Mason says. "The impacts of climate change are and will be unequal and unjust. People with the least resources will be most affected and least able to recover and live resilient lives in the face of climate change. These values coupled with our skills in engagement, assessment, planning, and intervention make social workers invaluable agents in addressing climate change." "We know how to build communities," Schmitz adds. "We have a long history of advocating politically, advocating for education." "The Council on Social Work Education, which had previously defined advancing human rights and social and economic justice as a core competency of social work practice, recently expanded this definition to include advancing environmental justice as well," Klemm says. "This is very good news, as it encourages more attention on preparing social work students to address environmental concerns in the years ahead. I hope we'll see increasing opportunities for continuing education and professional development in this area as well." According to Mason, "Social work roles on climate change span the micro to macro spectrum. We need climate-informed social workers at all levels of practice and in research and teaching as well. In the American Academy of Social Work and Social Welfare's Grand Challenge related to climate change, we talk about three broad areas of social work involvement: mitigation (limiting actual environmental change), adaption (building coping capacity and resilience in advance of environmental change), and treatment (alleviating health, mental health, and other well-being impacts during or after an environment change crisis or event). From organizing and advocating for renewable energy policy to helping a Hurricane Harvey survivor access the insurance payments that she is due to providing psychological first aid to someone who lost their home in the Oregon and Montana fires, social workers are helping professionals who are essential in meeting needs related to the human-caused problem of climate change." "It cannot be ignored that there's been a concerted effort to misinform the public," Klemm observes. "While the need for a healthy and safe environment isn't, by definition, a partisan issue, here in the United States, views about climate issues divide sharply along partisan lines. And key members of the Trump administration (including Scott Pruitt, head of the Environmental Protection Agency), have repeatedly promoted views about climate change that are at odds with global scientific consensus. Whether climate deniers who are currently in positions of power and influence are acting out of ignorance or because it benefits their own shortsighted interests, it seems clear that we have a great deal of work ahead to ensure that government is truly working on behalf of the people and for the common good. On this point, increased levels of civic and political engagement, including social action, will be key." "Social workers are skilled in engaging diverse groups, dialogue, and evidence-based research. We can use these skills to pursue inquiry with people who deny climate change, asking questions and seeking constructive conversation as an entry point for discussing the scientific consensus about climate change. We must not shy away from these conversations and questions, and neither should we blindly try to convince others without listening to their voices and trying to find common ground, values, or messages around which real dialogue can occur," Mason says. "Raising consciousness about the urgency of the climate crisis is really crucial, and there's certainly a role for social workers to play in helping to educate individuals and communities," Klemm says, adding that social workers "will recognize that information alone is often not enough. Truly reckoning with the realities of climate change can instill a profound sense of grief. The feelings of helplessness that may accompany an intellectual understanding of climate change can be immobilizing. The ability to attend to this emotional response—to be present with others as we all grapple with the implications of the climate crisis we face—is a necessary part of the work to help move us all from denial to action." Ultimately, Schmitz says, it has to be a grassroots effort. "It's a very long, hard, slow process to change communities," she says. "It's about building relationships, and civic dialogue is important." It's crucial, Schmitz explains, to help populations that feel isolated. "As they get involved politically, they become empowered," she notes. "As social workers, we tend to focus on developing clients' resilience or ability to adapt rather than resistance to the structural inequalities and policies that create such widespread vulnerability. Social work practice with individuals and families is extremely valuable and important. But the environmental issues we face also demand a collective response. Action is required at the local, national, and international levels," Klemm says. "Social workers have an ethical commitment to pursue social action and change," according to Mason. "Community organizing and political action are core to our profession, and we must call upon these to more actively pursue climate change mitigation through local, state, and national policy changes that significantly lower greenhouse gas emissions. Many cities and states are leading the way with climate mitigation, and social workers can look to these innovators and translate their work to their own communities." Adaptation to climate change, she observes, however, "may seem a more natural fit for many social workers. It's about coping and ensuring equal access to resources needed to deal with a changing climate." But social work action on mitigation is critically needed as well, Mason adds. Klemm believes social workers' experience as community organizers and advocates will be especially valuable at this point in time. "We need to support and participate in a wide range of efforts to dramatically reduce our reliance on fossil fuels and increase our access to renewable energy sources and must insist on regulations that protect people and the planet," she says. Disaster preparedness and response must be top of mind for social workers, Klemm says. "As social workers, we have a great deal of experience in addressing the psychosocial impacts and working to help develop resiliency among individuals and communities," she says. Klemm points to the need for leadership in the areas of scholarship, education, and all levels of government. "It will also be crucial to align with environmental organizations and others working for social justice to promote significant and lasting change," she says. Schmitz observes that climate-related disasters such as the recent hurricanes can aggravate mental health issues, and social workers will need to lead the effort to address these as well. She says some issues can be mitigated at the local level. Gardening, for example, helps improve mental health and contributes to the environment, and social workers, Schmitz notes, can play a role working with people one-on-one in community programs that help residents help themselves in multiple ways. "In the area of research, social work scholars have made calls to action for the profession to engage in environmental and climate work for more than two decades," Mason says. "Now, we need more rigorously designed studies that look at innovative interventions for mitigating, adapting to, and treating the impact of climate change." Schmitz would like to see social workers assume a strong role in public health and environmental science research. She believes the National Institutes of Health is going to be interested in how health is impacted, but also encourages social workers to consider conducting community-based and qualitative research to empower communities. "And social work educators," Mason says, "must strive to expand the traditional person-in-environment context to include the natural environment and how humans have radically altered and jeopardized it, as now articulated by the Council on Social Work Education in its new competencies, which explicitly address environmental justice for the first time." 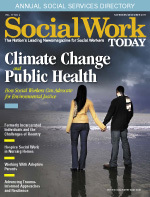 "As social workers, we are already engaged in many communities that are disproportionately impacted by climate change. We can and should play an important role in elevating the voices of the people whose concerns are not being heard and whose needs are not being met," Klemm says. "Working for change is empowering and fosters hope." "It's really important for social workers to educate ourselves to understand the basics of climate change. There are many resources available for anyone who wants to learn more," says Terri Klemm, MSW, LCSW, an associate professor of social work and director of the Bachelor of Social Work program at Centenary University in New Jersey who points to the work of Bill McKibben, an activist and author who created 350.org, which offers valuable tools on its website. Cathryne Schmitz, PhD, MSW, a professor in the department of social work at the University of North Carolina at Greensboro, notes the contributions of the Northwest Earth Institute (nwei.org), whose mission is to "inspire people to take responsibility for Earth. Its focus is on the complexity of the issues and the need to respond collectively." For the best science on climate change, Lisa Reyes Mason, PhD, MSW, an assistant professor at the University of Tennessee College of Social Work, recommends the Intergovernmental Panel on Climate Change assessment reports, which provide updates and news from the Environmental Protection Agency and the National Oceanic and Atmospheric Administration. "Especially pay attention to local and state initiatives related to climate change," Mason says. Schmitz recommends Thomas L. Friedman's Hot, Flat, and Crowded: Why We Need a Green Revolution — And How It Can Renew America, which connects global, climate, and social issues and illustrates how social workers can help address them. The skills needed to become better educated about climate change and to help both prevent and address it aren't found in textbooks, says Schmitz, who suggests starting by building communities. She points to three decades of work by Nobel Peace Prize winner Wangari Maathai, who started the Green Belt Movement in Kenya, where deforestation brought ruin upon rural lands and led to a scarcity of drinking water, an erosion of soil, and a lack of firewood that resulted in malnutrition. The story of her work empowering the local women to grow trees and renew a destroyed ecology is told in the film Taking Root: The Vision of Wangari Maathai, which, Schmitz says, demonstrates the power of community involvement and makes clear why a response to climate change must be interdisciplinary and community-based. To learn more, "talk about climate change with other people," Mason says. "Practice discussing the issue with climate change deniers and with people for whom climate change may not be their top priority. Listen, ask, inquire, learn, and share."